Weinerlebnisweg k – Staffelsteiger Verein e.V. The old Johan leaned at the wall, had a sandwich he has prepared in the morning and had a look at the Neckar valley. The whole morning he has pinned the long wine shoots to the wires. The winegrower enjoyed the warm sunshine in June after the many rainy days and nodded off. Suddenly he heard a deep a little bit grumpy voice. „I’m soo bored, Little Max, what’s going on in front of you? – You are not telling anything.“ – „Nothing special, Theodor! It is a nice sunny day and the old winegrower with the grey beard is sitting at our wall and relaxes.“ Little Max answered in bright and cheerful voice. The voices are of two stones in the dry walls. Theodor and Little Max have been friends for their whole live, namely many many years. Hundreds of years ago they have been knocked out of the same old rock to build the walls. 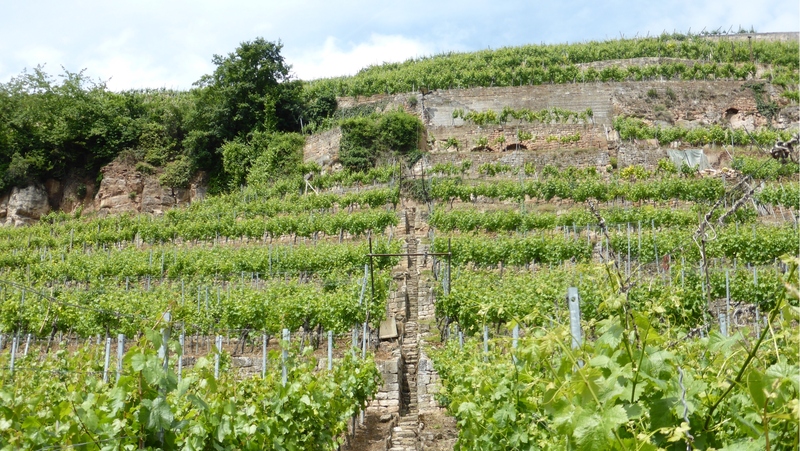 The places inbetween were not so steep so that wine could be grown there. Theodor became a big chunk, strong, together with other stones it pressed against the hill so that the slope did not slide off. Little Max was a little bit smaller, with its best side front and told Theodor what he could see in the vineyard and the Neckar valley, as his friend was rear between the soil not seeing anything. Both complemented each other well and although they were different they were friends, very old friends. Sometimes they squabbled with each other, especially when Little Max started to tell about wall lizards. „Hey Theodor! Three wall lizards took a sunbath on me today. It tickles when they scamper around.“ Oh yes, I know that feeling Little Max.“ Did I tell you that some small wall lizards sliped out“ „Yes, you have told me about this more than once and you have been telling it for 459 years.“ „So what, it is always great.“ „You are only jealous, that you cannot see the very small wall lizards.“ „Nonsense, I am not. I can see the wine, the sky, the sun, the winegrowers, the butterflies, the flowers and even the kestrels“ cried the bright voice rather loud. „But without me you could not lie so comfortable.“ „You can talk rubbish, but who does the whole work?“ Theodor mumbled from the depth. „Be quiet!“ cried a resolute voice near the wall. „Why do you argue all the time?“ – Oje – Aunt Elly is peeved. „We should be quiet“ murmured Theodor. Mostly the two friends got along well. 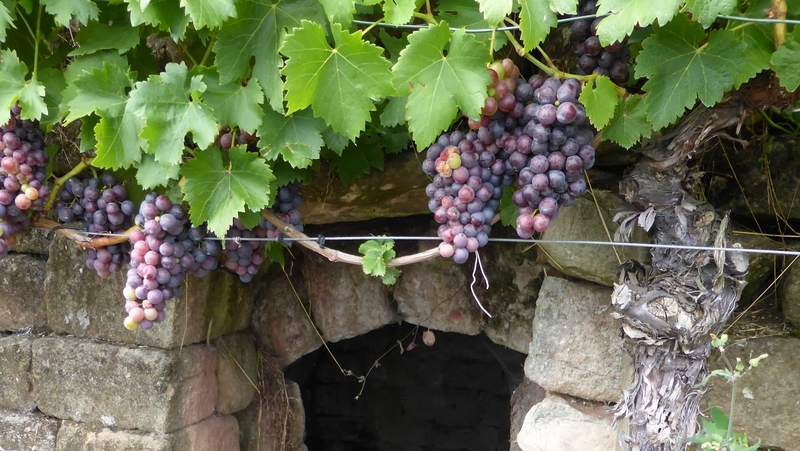 Little Max reported about the growing grapes and the old winegrower who relaxed at the wall. Theodor commented and sometimes Aunt Elly got a word edgewise. Old Johan accustomed to have his break always at the same place and to listen to the stones. He was not wondering about the fact that they could talk, he was familiar with them after work in the vineyard for decades. But he was worried about the stability of the very old wall. It was a very wet summer with many thunderstorms. One night it was raining cats and dogs and when Johan came to the wineyard in the morning he realized that the wall leaned forward. The old winegrower anxiously stroke the stones and listened to the deep bass of Johann who was very exhausted. „Little Max, think I can not manage to press against the hill anymore. Tonight it has stuttered suddenly and my neighbours are lying in skew position and can not support me.“ „Theodor, you have to hold out, it is so nice here, the grapes ripened, the wind is rustling in the wine leaves and the bees are flying between the blossoms of the violets, the stonecrop and the Kenilworth ivy … and did I tell you about the wonderful stone left of me. I only realized it now because the wall moved a bit forward.“ Little Max reported in detail about the speedy wall lizard they knew well. From the depth one could only hear an exhausted rumbling. „Aunt Elly, I am really woried about Theodor, he is so discouraged I have never experienced before.“ Mäxchen was so desperate. „Go on telling him what you can see, he will be glad to hear that and, by the way, the nice stone left of you is Klärchen. She enjoyes to listen to you.“ When stones could squinch up their face, Little Max would have grinned embarrassed. Old Johan smiled, he knew exactly, what stone Aunt Elly had in her mind. It was a bit red and looked very nice. The following days Little Max natted all the day long, he cheated a bit in order to cheer Theodor, because the sky was dark and it did not stop raining. One morning the wall was broken. When the old Johan came, he only saw a glorious mess of stones and soil. „What a miss-up?, little Max, where are you? Everything ok with you?“ „I don’t know, there is a lot of soil lying on me, I can’t see anything. Something presses on me“ one could hear from inside the pile of stones. And then a scolding voice from farther away. „That was a rumbling, the nice moss layer is damaged and the Kenilworth ivy is also gone.“ Aunt Elly has rolled down a bit down the slope. Despite of the bad luck the old winegrower had to smile, he took Aunt Elly and put it carefully aside the damaged wall. Immediately he started to work, he separated the stones from the soil and put them on a stack. It was very quiet. All stones were intact, so Johan did not worry. Only in winter he could think of repairing the wall, as the vintage was imminent. In January he started to rebuild the dry wall. He knew exactly the places of the stones in the wall. He also had his double pointed pick for knocking off a rub when the stones did not match together. Of course, he paid attention to the fact that Theodor and Little Max were lying one behind the other. When he found the nice red stone, he placed it right besides Little Max. At the end he worked on the last layer and straightened it. After some weeks everything was done and Old Johan leaned satisfied against his wall. When the sun warmed up the vineyard, the winegrower listened to the well-known voices. „Wow, it tickles again. It was the third wall lizard today. I believe slowly they get used to the new wall. Theodor, I am sure next year small lizards will slip out. Theodor, everything all right with you? I can’t hear you?“ „I have slept a bit, the last years were very exhausting. But now I am in best position and my back doesn’t hurt so much, will be glad to see the small lizards“, a well known bass murmured. „How does it look like at the front?“ – „It is wonderful. I have even a better view, because we are lying a bit higher, and I have a good-looking neighbour.“ – „Ach Litte Max – you said that nicely“, a delicate voice was to be hard. With Klärchen at his side Little Max was so tuned so peacefully and stopped to compete with Theodor because of the lizards. Old Johan continued to come to his wall regularly. His grandson Hannes helped him with the job in the vineyard and at noon they spent the break for lunch together. Everything was ok inside the new dry wall. 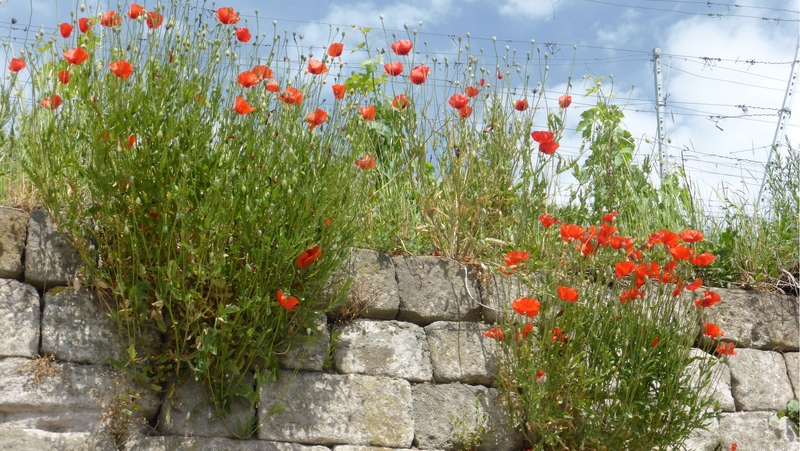 Little Max counted the wall lizards, Klärchen described the many flowers in the vineyard and Theodor grumbled approvingly from the depth, when he liked something particularly well. The old winegrower leaned back happily, when his grandson nudged him grinning. „Grandpa – we should go on working. I’ve just listened to Aunt Elly. She was disgusted about the long break.“ – This was a story by Barb Mehrens, read by Katja Thiele.